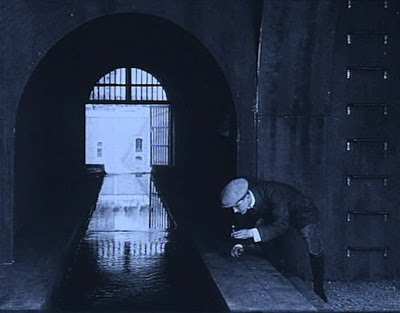 There's probably no such thing as a feature-length movie made prior to maybe 1920 or '21 that can really be suited for modern tastes, I will resentfully concede, but if we can pretend that there is, I'd like to nominate the third of Louis Feuillade's Fantômas films, The Murderous Corpse from November, 1913, as being much, much easier on a 21st Century viewer than Fantômas - In the Shadow of the Guillotine or Juve vs. Fantômas. And not just because at 90 minutes - over 20 minutes longer than any of the other four entries in the series - it's the only Fantômas that's in line with what we're inclined to think of as "feature length". Where the dominant mode of the first two films is of somewhat aimless, non-unified incidents marked out more by their weird inapplicability, The Murderous Corpse flips that around completely: its six-part structure is very coherent and clear, with scenes that build upon each other, with foreshadowing and all, but having a crisp, meaningful story to tell comes a bit to the detriment of the sublimely bizarre. It's not entirely to my tastes, as much as the previous films - the exquisite silliness of the flaming barrel escape or the batty insanity of the boa constrictor assassination from Juve vs. Fantômas aren't matched by anything until the last seven or eight minutes of The Murderous Corpse finally inject a sense of the demented and macabre into the proceedings. But certainly, it's enough to feel more like a movie, and less like a clip real of somebody's fever dreams about a master criminal. It can be readily slotted into a generic role more easily: it is by and large a mystery, for while we're quite sure that everything happening is the work of the dreaded Fantômas (René Navarre, present less often here than in the last two), and that puts us a step ahead of the heroes, we almost never know what Fantômas has done until much later. And the film's rather grisly parade of violent acts - culminating in a final-scene reveal that's absolutely skin-crawling, made more rather than less creepy because of the limited visual effects technology permitted to the filmmakers in 1913, and only slightly ruined because the title of the sixth chapter gives away the big surprise - is certainly more readily compared to the kind of movie that we actually watch nowadays than the broad, operatic gestures punctuating the first two. On the technical side of things, The Murderous Corpse is shockingly modern in its craftsmanship - not just by the standards of the earlier Fantômas films, but by what I thought I knew of 1913 filmmaking generally. Particularly with Feuillade being something of an aesthetic reactionary (he was slow to join the moving camera revolution of the mid-'10s), I was not at all expecting such a widespread reliance on close-ups and insert shots as we get here, with letters and pictures being presented in POV shots by the score, little details that are emphasised for our benefit in complete contrast to the more classical, withdrawn proscenium staging of the earlier movies. In one scene, Feuillade pans the camera to the left slowly, combined with the blocking to suggest something absolutely horrible just offstage: a wholly effective moment, and cutting edge stuff at that time. And did I not even see a little bit of cross-cutting? A scene in which Princess Danidoff (Jane Faber, returning from the first movie) is alone in her boudoir, unaware that Fantômas is creeping up on her, contrasting with the busy, laughing party that's happening elsewhere in her house, and while this technique was not at all new in 1913, nothing earlier in this series had touched it. Simple, barbarically simple, but it all serves to connect The Murderous Corpse to our 2013 idea of what a movie "ought" to be, and makes it a whole lot easier to simply attend to the film and enjoy it, without constantly having one's mental copy of Bordwell and Thompson's Film Art held open to the introductory chapters, so you can be absolutely sure that what seems corny and stilted was actually some of the most creative visual storytelling of the day. As for the story being told: as I said, it's a very sturdy mystery plot, hinging on the artist Jacques Dollon (André Luguet), framed for the murder of a baroness by you-know-who. What gets to be confusing is that in prison, Dollon is strangled to death, but when his body is to be taken to the morgue, it has disappeared, and over the next few weeks, Dollon's fingerprints keep appearing in crime scenes. The case becomes an obsession for La Capitale reporter Jérôme Fandor (Georges Melchior), who we last saw as he was being crushed to death in an explosion triggered by Fantômas at the end of Juve vs. Fantômas. In the very best serial tradition, Fandor's escape occurs offscreen and is waved away as though we could not possibly care how he managed to survive with only light injuries. Not so lucky was Inspector Juve (Edmond Bréon), who is sadly reported to have died in the collapse of the building, though no body was found in the rubble. I am not certain if that would have been as ridiculously obvious a red flag to 1913 audiences as it is to us: hoary clichés have to begin somewhere, and Fantômas is the origin for quite a lot of those clichés as they apply to melodramatic crime stories. There are no snakes; there are no garish plots to decapitate actors; there are no detachable arms; there is a breakaway wall. But what there also is, more importantly, is a really tight and intriguing mystery narrative, and I'm not going to say anything else about what happens, because unfathomably for a century-old movie that has influenced an entire genre, it's actually a little bit surprising in spots. Certainly, it's more clever than you think it is, or than I think it is anyway: there's a long scene during which Dollon is being checked into the criminal database, which involves measuring his skull (oh, phrenology, you were the most awesome hideously biased science ever) and taking his fingerprints, and this latter part goes on forever. "Hm, ah, well, in 1913, that was something that was striking and new in the movies", I told myself dubiously, "so that's why they're showing it at such tedious length". In fact, they were doing it to imprint that moment on the viewer's brain, so that when we see an inky fingerprint later on, it's a great "aha!" moment, and even greater because a film of unspeakably ancient vintage got the better of me so easily. Or maybe not Expressionism exactly, but come on. It's a sewer that looks like a giant keyhole. That's amazing. Still and all, I don't love it like the first two: it's all a bit normal-ish, and the alien strangeness of the others, especially Juve vs. Fantômas, deeply appeals to me. And bumping Fantômas himself to supporting status and giving Juve barely a cameo, in favor of the much less interesting (though far more competent) hero Fandor isn't exactly a trade up. But still, there's a whole lot to be impressed by, and if the first two movies somewhat demonstrated a high level of artistry for 1913, The Murderous Corpse is genuinely edgy, in its bleak content and the creative way it presents it, and that's impressive no matter what.